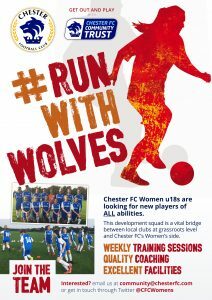 Chester FC Women U18s are looking for new players of all abilities and experience levels to strengthen the current squad. This development squad for players aged 15-18 is a vital bridge between local clubs at grassroots level and the Chester FC Women’s team, who compete in the Cheshire Women’s League. The club is committed to developing the women’s game and has exciting plans for the future with the U18s central to realising these ambitions. Under head coach Ben Richards, the squad have access to excellent facilities and train on Monday evenings with regular development fixtures on Sundays. This is a fantastic opportunity for young players to become part of the Chester FC family. If you are interested in joining the team or would like to know more email community@chesterfc.com or get in touch through Twitter @CFCWomens. Chester FC Community Trust have a fun-packed programme of holiday activities planned for boys & girls during the February half-term. 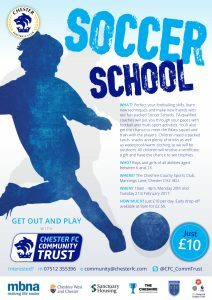 The popular Chester FC Soccer School will be running over two days at The Cheshire County Sports Club in Upton on Monday February 20th and Tuesday February 21st, and will help children perfect their skills with FA qualified coaches and make new friends in a fun environment. 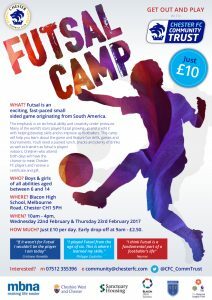 And there’s a new addition to the Trust’s programme with the first Chester FC Futsal Camp being held at Blacon High School on Wednesday February 22nd and Thursday February 23rd. Futsal is an exciting, fast-paced small sided game originating from South America. The emphasis is on technical ability and creativity under pressure. Many of the world’s stars including Neymar and Cristiano Ronaldo played Futsal growing up and credit it with helping develop skills and to improve as footballers. This camp will help children learn about the game through drills, games and tournaments. All participants will receive a certificate, gift and there will be opportunities to meet Chester FC manager Jon McCarthy and his players. Each day runs from 10am until 4pm and costs just £10 with an optional early drop-off available at 9am for £2.50. Children will need a packed lunch, snacks, plenty of drinks as well as appropriate footwear, shin pads and suitable clothing. Jim Green, chief executive of Chester FC Community Trust, said: “We’re really looking forward to the February half-term and have put together a fun and varied programme that will help youngsters have fun honing their skills and keep them entertained during the holidays. To book places or for further information email community@chesterfc.com or call or text 07512 355396. 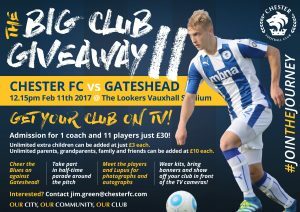 The Big Club Giveaway is back for next month’s game with Gateshead, which is being shown live on BT Sport. Following the success of the community initiative for the Lincoln City match in October, Chester FC Community Trust is again inviting junior teams to get behind the Blues and show off the excellent work being done within schools and clubs in the area. The Big Club Giveaway II promises to give youngsters a day to remember at the Lookers Vauxhall Stadium, including an opportunity to meet Lupus, the club’s mascot, and the players before the game for photographs and autographs. Vistings team are encouraged to wear their kits, bring banners and make lots noise, and will parade around the pitch at half-time where the crowd will applaud the efforts of the grassroots game. This time there’s an extra incentive as the game, which kicks off at 12.15pm, is being broadcast live on BT Sport and the club is opening the South Stand to put our community guests in the spotlight and hopefully give you the chance to be seen on TV!